A stay at Rosslea Hall is ideal for those seeking a hotel near Loch Lomond & The Trossachs National Park, which is less than 30 minutes’ drive through incredible scenery. It is the perfect base for visitors to experience the natural beauty in Scotland and enjoy some amazing outdoor activities. Loch Lomond & The Trossachs National Park was the first of two national parks established by Scottish Parliament in 2002. The park is centred on Loch Lomond, Great Britain’s biggest freshwater lake, and covers an impressive 720 square miles. The park attracts thousands of visitors ever year to marvel at the stunning landscapes. The park is split into four distinct areas: Loch Lomond; The Trossachs; Breadalbane; and Cowal. Across these areas you can explore a range of impressive natural scenery. The park is home to a staggering 21 Munros (mountains over 3,000ft) and a further 20 Corbetts (mountains between 2,500 and 3,000ft). There are 22 large lochs and many smaller lochs and lochans, and around 50 rivers and large burns. There are two Forest Parks, Queen Elizabeth in the Trossachs and Argyll in Cowal. Over 15,000 people live in the National Park as of the 2011 census. 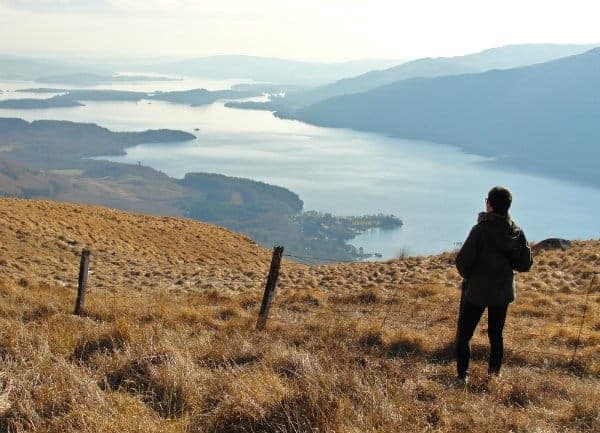 There are lots of things to do in Loch Lomond & The Trossachs National Park, and it is perfect for those who like to experience the great outdoors, with a wide range of activities to be enjoyed. Walking: The National Park is a walker’s paradise; its vast area offers an incredible range of walking routes, from tough hill walks to easy family friendly walks and long-distance tests. All of those routes take in some truly stunning landscapes as you scale the peaks of a Munro or stroll along the coasts of a loch – walks in the Trossachs capture the real magic of Scotland. Cycling: Those same incredible landscapes also offer plenty of opportunities for cycling, and you will always find lots of cyclists of all ages and abilities roaming the Parks. There are a number of cycle hire facilities in the parks, find the most suitable option here. Wildlife & Bird Watching: The size of the Park means there is an impressive array of wildlife, and you can have a great adventure just seeking out creatures in different corners of the Park. Bird watchers can often find osprey, golden eagles, and more around The Trossachs on the Eastern side of the Park. While to the west you can catch a glimpse of sea birds like gannets and guillemots around Cowal. Water activities: There’s always a wealth of fun water activities happening throughout the Park. You can get involved in everything from canoeing and kayaking to windsurfing and sailing. That’s not to mention the open water swimming options which can help you really experience the great outdoors. Climbing: What better way to experience adrenaline pumping adventure than with some rock climbing. There is something on offer for all levels here, from the seasoned climber to the tentative beginner. Fishing: Loch Lomond fishing is something many visitors look forward to and, with 22 lochs and 39 miles of coastline, the park offers a huge range of choices for fishing and angling. You will require a permit when fishing in the Park, which are available from a number of locations. Camping: A campsite in Loch Lomond can provide the ultimate in camping scenery, and there are plenty of options to choose from – whether you want a civilised campsite or some wild camping. The main campsite areas are the National Park campsite on Inchcailloch, The Cabin on the shores of Loch Lubnaig, and Sallochy Bay campsite on East Loch Lomond. Golf: Not surprisingly there are a lot of golf courses in Scotland, the home of the sport. There is an impressive selection of courses within the Park too, all complete with incredible scenery. You can find great courses in Aberfoyle, Callander, Killin, St Fillans, and more. Stargazing: After a day of exhilarating activity, you will be ready to lie back and be wowed by the beautiful night skies. The Park benefits from very low levels of light pollution, meaning the night sky is stunning in its clarity – and thousands more stars are visible than in more densely populated areas. For news of the latest events, view the park’s What’s On page. Just a short drive away from the heart of the Scottish outdoors, Rosslea Hall is one of the top Trossachs National Park hotels. We hope you will visit us soon.